There's an excellent ghosted [a 'fitted veil'] blue phantom to the main point of these crystals as well as a little diamond window and Hera base. 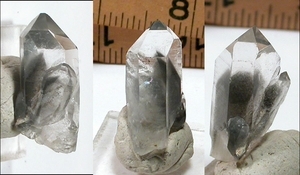 Both companion crystals are phantoms as well, one point has an uncommon stepped face. Tiny chipping at a baseline growth crater, and a bright rainbow. 1/2x 1-1/4" tall inclusive. Jewelry quality.